More prominent Nigerians have reacted to the New Year broadcast of President Muhammadu Buhari. President Buhari had during a nationwide broadcast assured that the year 2018 promises to be pivotal in the nation’s quest for change. Many of them in separate statements described the president’s message as ‘de ja vu’, as there was nothing refreshing in his broadcast. Senator Adeseye Ogunlewe and Chief Mike Ozekhome, yesterday, said the President failed to address critical national issues begging for attention. The senator representing Edo Central, Clifford Ordia, on his part said he had expected the President to come up with a blueprint on how to develop the Niger Delta region. He argued that the economy of the nation could only blossom if there was peace in oil-producing communities. “The issue of the Niger Delta is very key. I expected the president to have said something about his plans regarding that. If there is peace in the Niger Delta, our economy will be better. The Federal Government needs to develop a blueprint that will address key challenges in the Niger Delta. “We need to do more and ensure that Petroleum Industry Bill (PIB) is passed. This will address key issues in the restive area. It will also address the issue of host communities in the Niger Delta. “The issue of armed Fulani herdsmen is very serious and the presidency should do something about it. We cannot have peace until the government addresses the issue of herdsmen attacks in many parts of the country,” he said. Also reacting, Ogunlewe, former minister of works, said the New Year’s message was not in tune with contemporary realities. He stated that the country could not make any meaningful progress with the current constitution, noting that the insistence of the government to continue to do things the same old way will never yield any positive result. “Buhari should listen to people who have done researches on how to solve the problems of the country before he goes on air to speak.He should go and look for various research on how to solve the problems of the country,” he said. Ogunlewe added that it was not enough for the President to be talking about building infrastructures without talking about how the projects would be funded. 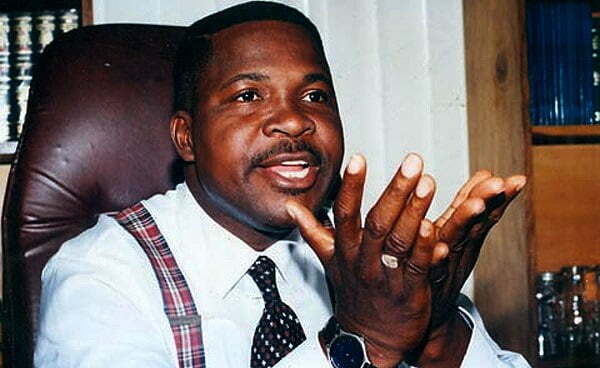 Lawyer and rights activist, Chief Mike Ozekhome (SAN) also faulted the president who he claimed failed to address the biting sufferings in the land as well as the petrifying and oozing corruption within his government. “PMB’s New Year’s address is embarrassingly banal, uninspiring, empty, myopic, unrealistic and bereft of any benefit of historical dynamics. It is an unfortunate metaphor for one who has lost total touch with the people and their aching pulse. The speech comes straight from Stone Age Australopithecus verbiage that never showed any gravitas, sincerity of purpose and honest admission of abysmal failure, total directionless and cluelessness in the current opaque governance of the country. “It (the broadcast) never talked about nor told Nigerians what he is doing about the putrefying and oozing corruption squarely located within his government, with overwhelming and incontrovertible evidence of fat untouchable cows left unprosecuted,” he noted.